The Watlow pre-coiled, cable nozzle heater has been formed into a compact, tightly wound coil to supply 360 degrees of heat. This nozzle heater features a 5 in. (127 mm) long, no-heat tail section, which eliminates failures in the adapter area due to overheating. 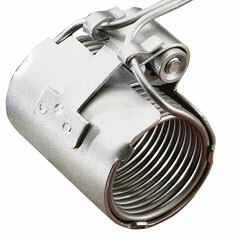 This cable nozzle heater is manufactured with Watlow's swaged compaction process. This process provides a greater compaction of the MgO insulation than the competitor's rolling process. Compacting MgO insulation into a solid mass results in excellent heat conductivity and high dielectric strength.